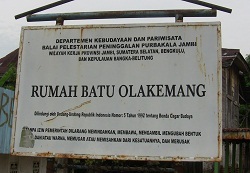 Office of Tourism’s Sign in front of the home of Pangeran Wiro Kusumo. The home of Said Indrus, also well known as Pangeran Wiro Kusumo (Kesumo), is located on the north side of the Batanghari River in the City of Jambi. Its exact location can be found by clicking this link. Information about his life and exploits can be obtained with this link. Information about his grave can be obtained with this link. Who was Pangeran (prince) Wiro Kusumo? 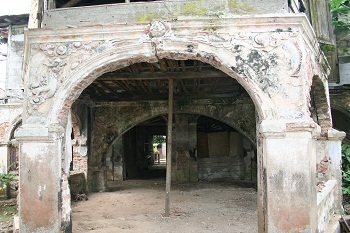 Arched entry at the south side of Pangeran Wiro Kusumo’s home (north of the Batanghari River in the City of Jambi). In 1830 there were only 20 Arabs that lived in the City of Jambi, out of the town’s total population of 600. These Arabs were only nominally subject to the sultan’s authority. Due to them being economically powerful and a highly respected group, they were closely associated with the Kraton (the ruling elite in Jambi), an association that helped them assert their independence. 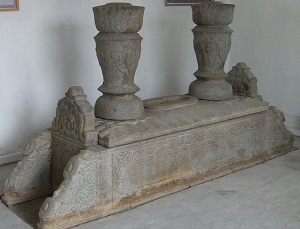 Some of them would play important roles in 19th century Jambian history.